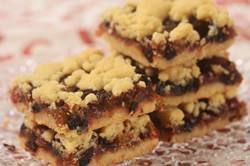 Shortbread and Mincemeat are two British specialties that go wonderfully together. It wasn't until I saw a Mincemeat Shortbread recipe in Sue Lawrence's On Baking cookbook that I thought to combine these two delicacies. The buttery flavor and crumbly texture of shortbread can easily stand alone, but combining it with a spicy rich mincemeat makes for a very tasty bar (square). You will definitely want to add these to your list of Christmas baking. Mincemeat is a spicy preserve consisting of a mixture of dried and candied fruits, apples, and spices (with or without beef suet) that is heavily laced with brandy and/or rum. Originally it was made with meat (hence the name), eggs, dried fruits and spices. However, over time beef suet (kidney fat) came to replace the meat and the eggs were dropped completely from the recipe. While you can use commercially made mincemeat, I encourage you to try the recipe on the site for Homemade Mincemeat. It is vegetarian and easy to make. I think its flavor is superior to a lot of commercially made brands. The Homemade Mincemeat Recipe makes about 6 cups (1.4 liters), so you can make these bars and still have some left over to make other recipes. But if you decide to use store bought mincemeat, you can improve its flavor by adding a splash of brandy or rum and some freshly grated apple or a squeeze of lemon juice. Mincemeat Shortbread Bars: Preheat your oven to 350 degrees F (180 degrees C) and place the oven rack in the center of the oven. Butter (or spray with a non stick cooking spray) a 9 inch (23 cm) square baking pan. In the bowl of your electric stand mixer, fitted with the paddle attachment (or with a hand mixer), beat the butter until smooth. Add the sugar and vanilla extract and beat, on medium speed, until creamy and smooth. Add the flour mixture and beat just until incorporated and you have clumps of batter (not a solid ball of dough). Evenly press about two-thirds (370 grams) of the shortbread onto the bottom of the prepared pan. Lightly prick with the tines of a fork. Bake the shortbread about 16 - 18 minutes or until lightly brown. Remove from oven and evenly spread the mincemeat over the shortbread base, leaving a 1/4 inch (.5 cm) border. With the remaining shortbread dough, using your fingers, crumble it over the top of the mincemeat. Then lightly press the dough into the filling.